Who’s sandwiched between Maeve Binchy and Nick Hornby in the Amazon charts…? … answer: our very own Nigel Edwards. I’m proud that readers from continental Europe are buying (and hopefully enjoying) our English language eBooks. I don’t often check our sales figures, though, as the volumes are so low. But the low volumes can throw up unexpected and amusing results. 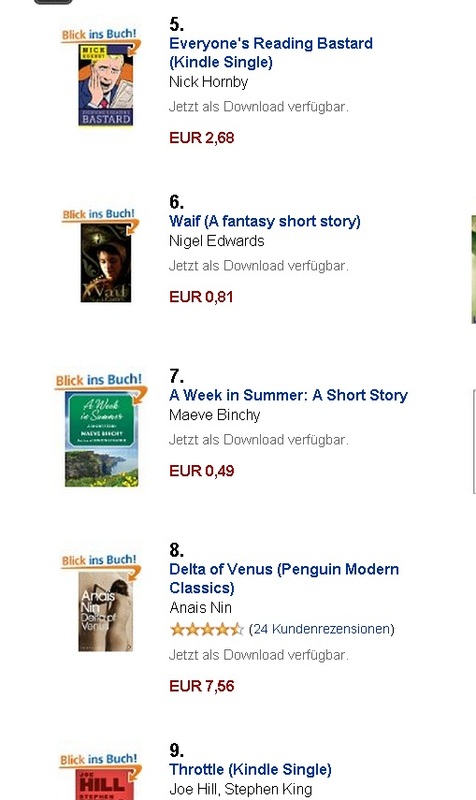 Right now, for example, in the German short story charts, our book, Waif, is at number 6, behind Nick Hornby and Mark Twain, but above Maeve Binchy, Anais Nin and Stephen King. 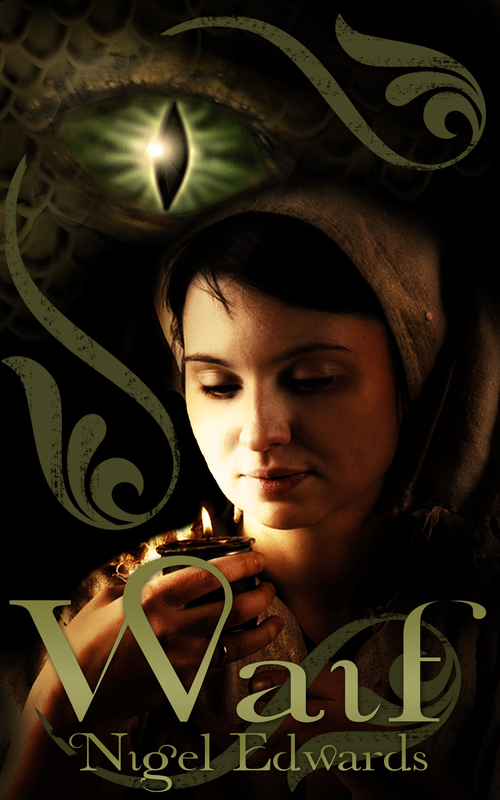 Waif isn’t the only book of ours to chart on the continent, but it is the most consistent. Perhaps the title and artwork cross national boundaries well? Even within English-speaking countries, Waif isn’t consistent. Looking at the Amazon customer reviews, it seems more popular in America than the UK, despite being written by a Brit (though certainly not an Englishman — Nigel’s Welsh). This entry was posted in Thoughts and tagged 50 shades of grey, amazon charts, amazon reviews, kindle store, short stories. Bookmark the permalink. 5 Responses to Who’s sandwiched between Maeve Binchy and Nick Hornby in the Amazon charts…? Congratulations, Nigel and Greyhart, for the e-proximity to best-selling authors, Binchy and Hornby! I think there’s far more to those kinds of coincidences–or coincidings, as I prefer to call them–than the rational world would have us believe. Big houses, IMHO, have lost their touch, hence, the universal scorn for 50 Shades (I’m hearing the same pooh-poohs in Canada). So, Tim and authors of Greyhart, let’s just keep proving ourselves with every book, sale and mind-blowing review. To follow up on Elaine’s comment above (as a Greyhart writer), I really do hope that small presses like Greyhart (and I noticed a few others from the UK, USA and Canada) really do get a bigger slice of the pie in the future. They provide writers with greater creative freedom and allow writers a bigger share in rewards. For example, before I started shopping VampCon to small presses, I ran it by several agencies. (If you want to know exactly, it was 92 literary agencies over the course of 8 months). Of those 92, 9 agents asked to read the entire manuscript. A couple never got back to me. The ones that did all praised the writing but told me that it wasn’t quite write for them. Finally, the last agent to look at it (the wonderfully candid and friendly Becca Stump at Prospect Agency in Brooklyn) actually gave me a few details. She told me that the story had “excellent sense of pacing and voice” (yay!) but that “unfortunately many publishers are resistant to accepting new vampire series these days.” I totally get it. The big presses, the ones who work only with agents, need to hedge their bets. From their point of view, the vampire market is over-saturated. But I have my own opinion of vampire stories which is that people never get tired of vampires. It’s like Monday Night Football (or Premier League Football for those of you in the UK). Vampire stories are an institution; they seem to do well year in and year out. Every few months, new vampire books and movies come out. Presses like Greyhart gave me another chance, one less controlled by big businesses needing to make big profits (although I do want to take every opportunity to turn a tidy profit on VampCon). A chance I might have not had a few years ago, before the advent of eBooks. Anyway, thanks for reading through this rather lengthy post which- I guess- is just a long way of saying that I’m excited about the small, independent press model.